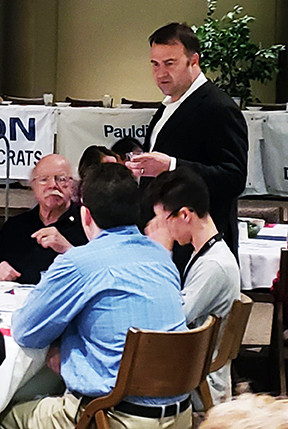 ARCHBOLD — Following on the heels of the local Republican party’s recent Lincoln-Reagan Dinner featuring Congressman Jim Jordan, local Democratic party members of Defiance, Fulton, Henry, Paulding, Putnam and Williams counties came together for their annual fundraising dinner. The event was held last Thursday evening at Northwest State Community College in Archbold. The main speaker for the dinner was Ohio Democratic Party Chairman, David Pepper. Though unable to attend the dinner, The Sentinel did speak with Mr. Pepper following the event, asking what message he brought for his party’s faithful in northwest Ohio. Mr. Pepper was also asked the same question posed to Ohio Congressman Jim Jordan at the Republican Party of Putnam County’s recently held Lincoln-Reagan dinner. Given his public position as head of the Ohio Democratic Party, what is something about himself that his more conservative critics might find surprising?